I have been receiving weekly reports from people living on the eastern coast of the United States telling me that they are seeing many strange things flying in our skies. The continuation of large airplane size Orbs continues especially by those living near the Atlantic Ocean. I have weekly emails telling me that these mysterious plasma filled huge Orbs have been seen silently flying across the sky as well as others reporting watching an orb hover overhead. 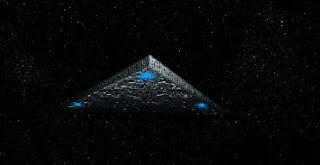 Another craft being heavily reported to me by people on the east coast this summer are large triangle crafts. They have told me that the size of the craft was like nothing they had ever seen before covering an entire block or parcel of land the size of two football fields. Oddly the people also claim that these huge triangle size crafts change shape and appear to swing out from the triangle shape into a straight line of lights where it hovers until reforming into the large triangle shape. I have been told that these crafts simply glide silently away until they either blink out of existence or hit an incredible speed and take off in a few seconds time. I have no idea what any of these crafts may be. I have no idea if they are from this earth or from another place in the universe. I have no idea if they are visiting from another dimension or time. The only thing I do know is that many people are seeing them. I have to think I agree with many of those who have encountered a large Orb that they do have an “alive “ quality to them. I saw one after last year’s hurricane Sandy with my family and we all felt it seemed to be a creature as well as a craft. It is hard to explain something you have not seen before but what we saw was a flying craft style object that seemed to be gas like or liquid and gave off the impression it was part living as much as it was part machine. I think it is something we have yet to encounter on earth and is very hard for a human to categorize the strangeness of this new object or animal or whatever it is flying our skies. Yet still another reported style of craft has recently been reported. It is a craft that is transparent or translucent. This craft is said to give off a heat signature from the bottom of it as it moves or hovers. These objects have form but you are able to see through it to the sky or stars behind it. I have a report of a recent sighting of this ship that I will attach at the the bottom of this article . Of course I do not have any idea what technology is being used to produce this type of craft however I feel safe in saying it may not be man made, not by human hands. I often wondered about this being the case with the Orbs as well, The Orbs seem to come in many sizes. It could be the extremely large one house many smaller ones which they release to spy, observe or encounter us here on earth. Once they finish with their missions they move back into the large Orbs to travel to the next destination. I do think some type of biological material is used in these objects as they seem to move and look more like a living thing than a solid machine. Of course this is all theory on my part with a strong want of knowing what all these strange objects are and a never ending curiosity of wanting to know where they come from and what they want from mankind. For now all I can do is report what I am being told and hope that one day we will have more knowledge, more open minds and more help from our fellow humans in understanding all of these issues. Keep alert and pay attention to what you’re doing and what is around and above you at all times. Know it is just a matter of time before it may be your turn to look in to the cold strange eyes of the unknown!